Maize lethal necrosis and other plant viruses pose a serious threat to global food security. KNOXVILLE—Plant diseases pose a serious threat to global food security, especially in developing countries, where millions of people depend on consuming what they harvest. 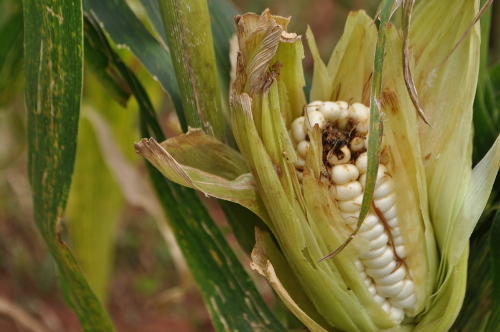 In sub-Saharan Africa, one plant disease in particular – maize lethal necrosis – is ravaging one of the region's preferred crops for food, feed and income. But understanding its biology in order to manage the disease is difficult because the disease arises from two viruses interacting – which is where mathematics comes into play. A team of researchers at the National Institute for Mathematical and Biological Synthesis has used mathematical modeling to better understand the dynamics of the disease and how to manage it. Their research results, published this month in a study in the journal Phytopathology, could not only help improve our understanding of maize lethal necrosis but could also help inform the management and control of other destructive plant diseases caused by combinations of pathogens. The study focuses on maize lethal necrosis disease in Kenya where crop losses are particularly high. Infected corn plants die prematurely or are frequently barren, drastically reducing the yield. Most of the nation's maize supply comes from small to medium-size farms, which are less able to withstand threats to their food production than large resource-rich farms. The study found that a combination of rotating crops, controlling insects, and using virus-free purchased seed provides the best disease control, but such a management strategy is usually only available to large commercial maize farms with sufficient resources to afford agrochemicals and purchased seed. Resource-poor farmers, with smaller holdings, who rely primarily on crop rotation and removing diseased plants, can only achieve a more limited control, the study found. For both types of farmer, synchronized management over large areas would be needed to provide long-term, sustainable control. The results emphasize the value of mathematical modeling in informing management of an emerging disease especially when epidemiological information is sparse. "Mathematical modeling can play an important role in integrating what biological information is available with reasonable assumptions on what is missing to give at least a first indication of the potential effectiveness of disease control options. Modeling can also indicate and help prioritize some key research questions that need to be addressed in seeking long-term sustainable control options," the authors write. "The modeling framework is potentially informative for other cropping systems in which coinfection has devastating effects," they wrote. The research was a result of efforts of the NIMBioS Working Group on Multiscale Vectored Plant Viruses, which included mathematicians, ecologists, plant pathologists, and evolutionary biologists who met over several years to develop novel mathematical methods for the study of plant pathology. The Working Group was established following the NIMBioS Investigative Workshop on Vectored Plant Viruses, held in March 2014.